Preheat the oven to 350°F and prepare cupcakes according to package directions. Cool completely before proceeding. In a piping bag, add thick stripes of caramel to the sides of the bag before spooning in the chocolate frosting. This will give a caramel swirl when the frosting is piped onto the cupcake. Pipe frosting onto all cupcakes. Crush mini pretzels to sprinkle over the top of the frosting. Garnish each cupcake with one whole mini pretzel. Forget about diamonds. The 3 C's apply to desserts too. Chocolate. Caramel. Cupcakes. It's that simple. I'm a chocolate, salted-caramel freak. Seriously, I love those things in combo. Cookies, cakes, puddings, pies... anything! It's so super easy to make these cupcakes by adding some gooey caramel to the frosting and delicious pretzel crumbles. Wow! First, bake up those Betty Crocker™ Super Moist™ cake mix into cupcakes (any of the chocolate flavors). I bet you know how to do this in your sleep. Spoon thick stripes of the caramel along the sides of a piping bag or regular plastic food storage bag fitted with a large star tip (if you have one). Then add the Betty Crocker Rich & Creamy chocolate frosting to the bag. The bag looks all messy. Prepare for that. Nothing truly decadent is as neat as a pin! But trust me. This easy add-in will be soooo worth it. Pipe this mixture out of the bag onto the cupcakes and -- voila -- you've got creamy chocolate frosting wtih a luscious caramel swirl. Check out the sweet caramel...can you stand it? 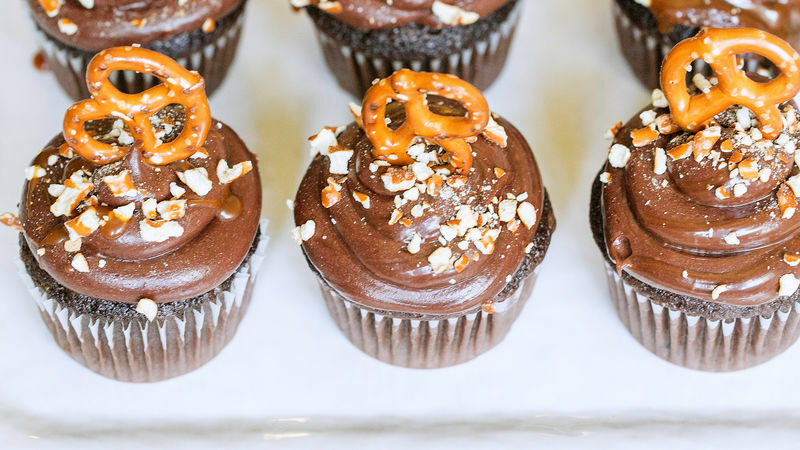 Finish 'em off by sprinkling pretzel crumbles on the top of the cupcakes and garnishing with a whole pretzel. If that doesn't make you drool, I don't know what will! Dig in!